You may or may not know that the so-called "Bushido code" was popularized (and somewhat canonized) by Inazo Nitobé [sic] in Bushido: The Soul of Japan (1900) and first published in English. One could say that the canon word for "veracity" in the sense of the "Bushido code" is the English word "veracity". Only some years later, after being popular overseas, was the book translated into Japanese. 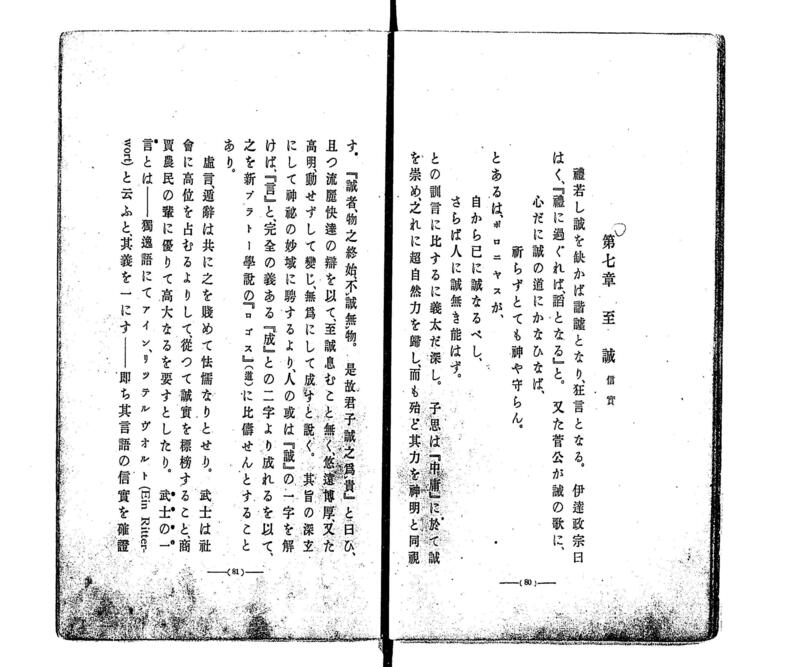 This early translation (from 1908 by 桜井欧村) is available at the 国立国会図書館 (National Diet Library). The translation uses the kanji 誠 makoto for "veracity", which would also be the standard way of writing it now. Just be aware that "correct for the bushido code" is maybe not as clear as it would be if there were a canonical reference in Japanese. Here is the relevant page from the Japanese translation of Bushido: The Soul of Japan. P.S. Note that there is some overlap with the Five Constants (五常) of Confucian ethics (仁 benevolence, 義・义 righteousness or justice, 禮・礼 proper rite, 智 knowledge, 信 integrity), where "veracity" or 誠 makoto may be matched to "integrity", written 信 which may also be read makoto. It is unclear what you're asking. Neither of those kanji are used to spell bushidō; both are used to spell makoto, in addition to (less commonly) the kanji 実. In names, Makoto may also be spelled with single kanji as 允, 信, and 慎. Not the answer you're looking for? Browse other questions tagged kanji terminology literature or ask your own question. Which kanji to use for 'change television channel'? Which radical name should I study for the kanken? Which is the difference of meaning beetween 業 and 行? What Unicode code points are needed to write Japanese Jōyō-Kanji?